For this assignment we had to practice creating and setting up props to tell a story of a book, whether it portrayed the contents of the book, or a particular message the photographer wanted to convey. I chose a book entitled Raven of a collection of woodcut art by Dale Burlison De Armond and accompanying parables recorded by John Swanton in 1904. 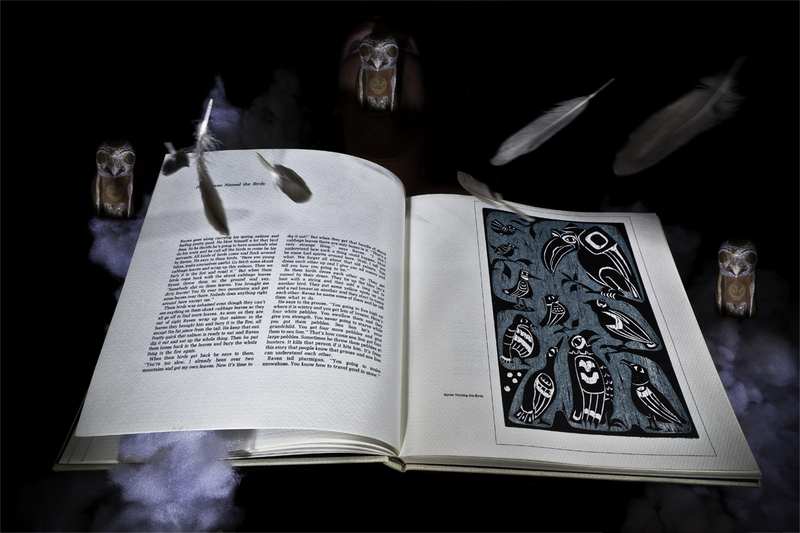 It is a stunning book, with thick textured paper in a heavy hardbound cover retelling the lost stories of Raven’s mythological significance to Native American culture. For me this book holds power due to my connection with the bird and its mysterious, resolute rebelliousness, as well as a few personal tales where Raven has played a siginificant role in my life. The resulting photograph depicts Raven as the creator and destroyer, the creature pulling the strings of our world, playing its game in whatever way Raven wishes. The book is open to a story entitled, “How Raven Named the Birds”. The book is elevated on four bricks, allowing me enough room to slide between them and rest beneath the book, giving the perspective of it resting upon my chest. I cut open a pillow and used its cotton stuffing for clouds and hung various feathers collected throughout my travels on fishing line tied to two c-stand arms above the scene. They represent the death and rebirth of birds, in this case, rising and falling in and out of the book’s pages. And signifying the all-powerful bird, I placed Raven in my open mouth as if emerging out of my dead body. After a number of shots triggered remotely, I was able to merge a few images in PS5 to add two extra Ravens and a few more clouds to the scene. 24mm, 1/13 sec at f/20, ISO 100, tripod mount, trigger fired.